Treat your cat to some shelving they can scale while at the same time having something that looks good in your home. 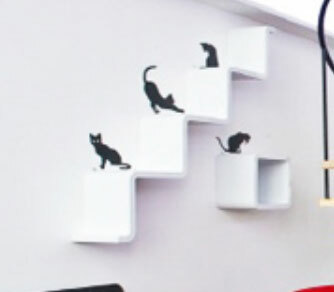 From stair shelving to cube shelving that is spaced out, you can mount pieces in a stylish fashion that will also allow your cat to explore vertically and play. Bonus these shelves can also be used to store clutter as well as support your feline friends exploratory nature. Owning cats and other pets confers a lot of benefits. These sweet, fluffy companions can help relieve your stress, lower your blood pressure, and even lower your risk of heart disease and other ailments. Plus, they look awfully cute when they’re snuggled up in your lap. But keep in mind your cat likes to play and they love to climb! These unique shelving units can be designed to take a number of shapes. They can take a stair-step design or have turned-up edges. They have sleek, smooth edges, and they are white with panels in contrasting colors. These floating wall shelves can be used to keep cat food or toys right where you need them. You can even use the shelves as kitty loungers. They are strong enough to hold a cat, and they provide a flat surface that will let cats lounge by a window or other attractive area. The rectangular modular shelves are put together using the same parts and construction as the CX2 shelving units. These pieces snap together to create small, cubed shelves or L-shaped shelves. They are easy to put together, and they can be mounted just about anywhere in your home. These shelves create the perfect location for small cat toys, bags of treats, or even a few cans of food. The right configuration of these shelves will make a practical storage area look like stylish decor instead. They will also help you clean up the clutter that usually creates a mess out of your cabinets. Have a little fun with your wall shelving and choose this dolphin-shaped shelving unit. The unit is composed of a couple of small cubes, an L-shaped unit for the tail, and a T-shaped unit for the spout of water. The front cube also includes a small fabric bin to keep stored items out of site. This dolphin-shaped wall shelving adds a touch of whimsy to your kitty corner. You can even add a cat figurine to the shelf to show off your love of cats and to set the theme for the storage area. Each of these decorative shelving units has a small storage cube and a flat shelf with a curled end. Each of the cubes has a small fabric bin, which makes it easier to store small, loose items such as cat toys or pill bottles. You don’t have to worry about these items falling off the shelf, and you can stack multiple items to take full advantage of the space. The soft gray drawers can also be collapsed if you don’t want to use them. The shelves offer flexibility in color options and in the turn of the curled ends (they can point up or down). Cats are natural hunters and explorers. Yet most don’t get a chance to climb trees or hunt rodents the way they would in the wild. If you have an indoor cat or just live in the city where cats don’t get a lot of opportunity to head outside, you can provide them opportunities to climb with this staggered shelving unit. 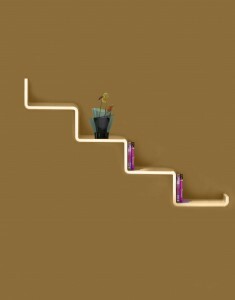 The stepped shelves allow your cat to climb as high as you let them. You build the shelves to create a stair going straight up, or you can build them to create twists and turns to make it more interesting for your cat. You can also turn these shelves on the side to create a more traditional wall shelf for storage. These modular floating wall shelves offer plenty of flexibility to create whatever storage you need. The shelve scan be stacked on top of each other or placed side by side. The simple shelves allow you to keep whatever supplied you need near, including medicines, food and treats. You won’t be able to fit a whole bag of cat food on the shelf, but you can keep a small jar of food there or stack a few cans there. The shelves have a small lip at the end to keep items from falling off the edges — or from being batted off the sides. The shelves come in a white or black finish, and they can be mounted on the wall or stacked on a table top or book shelf. This corner shelving unit comes with five cubes of different sizes that can be stacked on top of each other. The cubes offer enough room to store bags of cat food and any other gear you need. If you want to use the unit more creatively, you can set the cubes up as a kitty jungle gym. Your cats will love climbing the unit or curling up for a nap inside one of the cubes. You can also mount these cubes on the wall individually. They have a white or black finish with contrasting color panels. 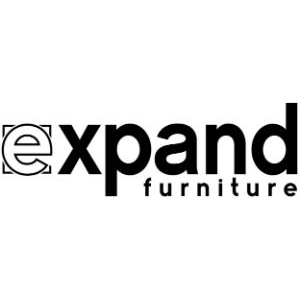 The shelving systems at Expand Furniture can be easily snapped together in a number of configurations to meet your needs. You can create storage for your kitty gear, or you can set up fun areas for your cat to play, exercise or sleep. 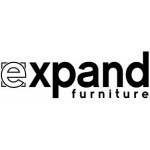 In addition to our stylish storage options for cat lovers, we also have a number of other space-saving furniture options to maximize the usable area in your home, such as hidden beds and expandable tables. Explore our catalog to find the solutions you need or contact us today.